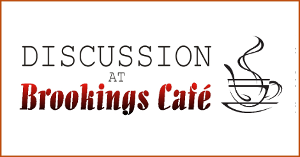 Discussion at Brookings Café: What is Real News? We have all heard about “fake news.” So then, what is real news? Where do you go to find out what is really happening? When the earthquake hits, where are you going to turn to get the information you need? Today, homegrown news sources are everywhere with theories of why the world is so crazy. The scary part is that “the news” seems to be tailoring itself to what you want to hear. You could easily find yourself living in a bubble of the news you want to hear. Meanwhile, the rest of the world goes on without you. So … the question is what is real news?